Barley Straw is absorbent and has some natural sterilising and deodorising properties that make it useful for calf bedding. Bedding should be at least 200-300mm deep, if pens are to be used continuously always keep a layer of at least 100mm of fresh bedding on top of soiled bedding. 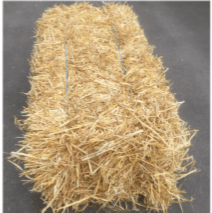 Wood shavings and barley straw are recommended bedding types for calf pens, they offer relative warmth and absorbency. Good calf bedding management and pen cleanliness minimises faecal-oral transfer, ammonia build-up and heat loss. The more frequently soiled bedding is removed and replaced with fresh dry material, the lower pathogens and ammonia problems will be. Also, if a calf has no alternative but to lie on damp bedding, the bedding will conduct body heat away from the calf that it could otherwise use for growth. Bedding should be at least 200-300mm deep, if pens are to be used continuously, always keep a layer of at least 100mm of fresh bedding on top of soiled bedding.